'You are to distribute this land among yourselves according to the tribes of Israel. You are to allot it as an inheritance for yourselves and for the foreigners residing among you and who have children. You are to consider them as native-born Israelites; along with you they are to be allotted an inheritance among the tribes of Israel. In whatever tribe a foreigner resides, there you are to give them their inheritance,' declares the Sovereign Lord." Beginning in chapter 40 Ezekiel began announcing promises to Israel that included hope of restoration and a description of their new temple that will again host the Glory of the Lord. Now, as Ezekiel finishes his prophecy the Lord identifies for the restored people of Israel the new divisions of the land of Israel for the twelve tribes plus the Levitical portion of the land which include the sacred district that contains Jerusalem. 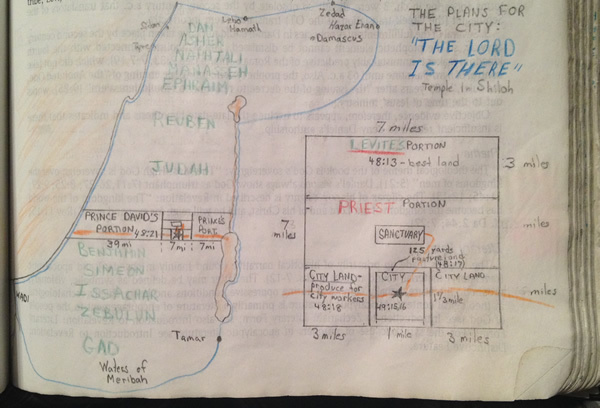 The division of the land in Ezekiel is similar to Joshua’s division of the land with one major exception: this time the portions will be equal. Also worth noting is the fact that foreigners (aliens) who had converted to the religion of the Jews to worship Yahweh and were living in obedience to the covenant could reside among the natural tribes of Israel in the land. In 2 Kings 16:10 demut means an exact pattern to use in order to produce actual things. In Genesis 1:26 demut refers to the original that is to be duplicated. In Ezekiel 1:10 demut is the shape or design that is copied. I will live productively and responsibility today, but I will maintain hope in a future eternity with the Lord. 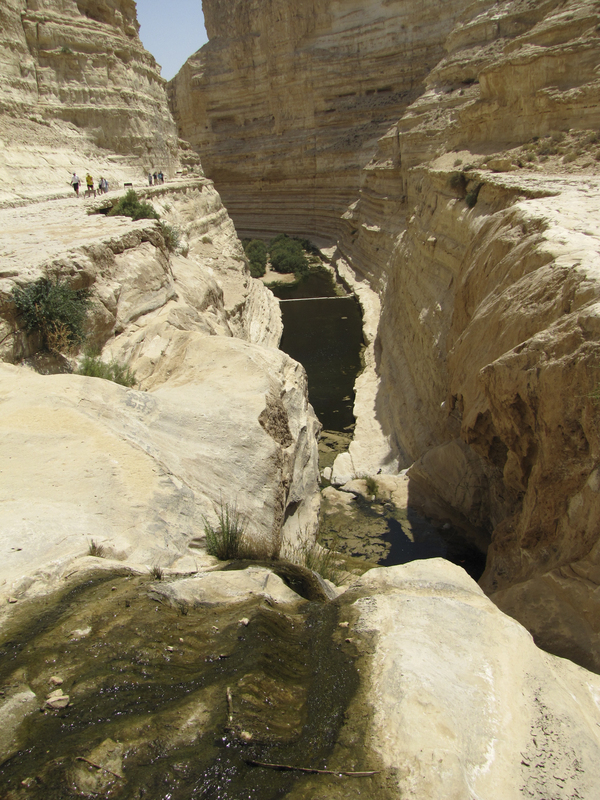 A wadi in the Negev. 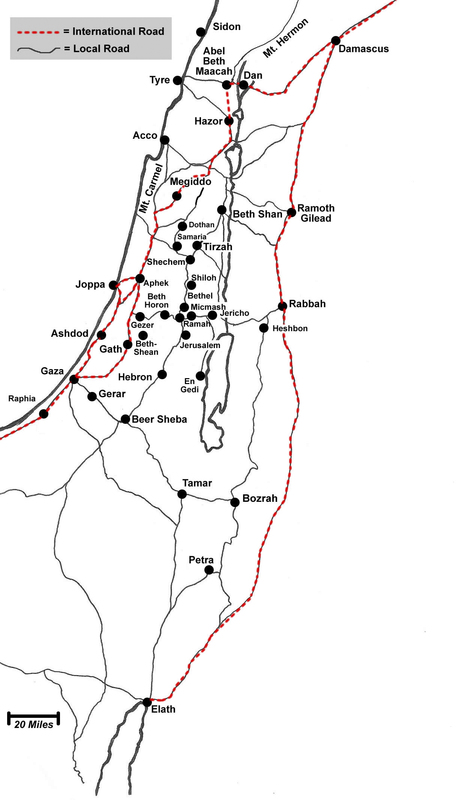 A map of the International Highways from the Old and New Testament and the local roads including the Beth Horon Pass that led travelers from the Coastal Plain and the plain of Aijalon up through the Judean hills to Jerusalem. Job 38:16 mentions the springs of water in the floor of the ocean that feed the seas. These springs were discovered in the second half of the twentieth century. Until then it was assumed the oceans were filled by rain and being fed by all the rivers of the world. "Like a roaring lion or a charging bear is a wicked man ruling over a helpless people." 13 The money brought into the temple was not spent for making silver basins, wick trimmers, sprinkling bowls, trumpets or any other articles of gold or silver for the temple of the Lord; 14 it was paid to the workers, who used it to repair the temple. 15 They did not require an accounting from those to whom they gave the money to pay the workers, because they acted with complete honesty. 16 The money from the guilt offerings and sin offerings was not brought into the temple of the Lord; it belonged to the priests. 8 As for the other events of the reign of Jehoahaz, all he did and his achievements, are they not written in the book of the annals of the kings of Israel? 9 Jehoahaz rested with his ancestors and was buried in Samaria. And Jehoash his son succeeded him as king.